People started to settle in Tianjin in the Song Dynasty (sòng dài 宋代). By the 15th century it had become a garrison town enclosed by walls. It became a city centered on trade with docks and land transportation and important coastal defenses during the Ming (míng dài 明代) and Qing (qīng dài 清代) dynasties. After the end of the Second Opium War in 1860, Tianjin became a trading port and nine countries, one after the other, established concessions in the city. Historical changes in past 600 years have made Tianjin an unique city with a mixture of ancient and modem in both Chinese and Western styles. 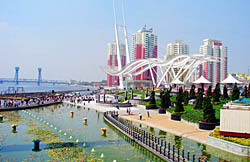 After China implemented its reforms and open policies, Tianjin became one of the first coastal cities to open to the outside world. Since then it has developed rapidly and become a bright pearl by the Bohai Sea. Tianjin falls within the temperate zone, and, being a port city in northern China, it is frequently affected by tidal air currents. The annual average temperature here is about 13 degrees C. July is the hottest month, with the temperature above 26 degrees C., while January is the coldest, when below freezing temperatures can be expected. The annual precipitation of the city is not much, although occasionally plagued by monsoon weather in summer time. Despite the fact that there are cloudless skies almost two-fifths of the year here, it is suggested that travelers visit Tianjin either in spring or in autumn, when it is neither to hot nor too cold. 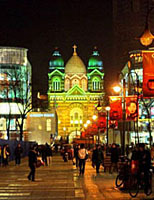 Blessed with variety of tourist attractions, Tianjin is a good place to explore. Nanshi Food Street (nán shì shí pǐn jiē 南市食品街) is a building of classical palatial architecture. It occupies an area of about 40,000 square meters. In the street there are more than 100 dining halls and food shops, in which assemble Tianjin local flavor snacks, dishes of the Eight Styles of Chinese Cookery, and other typical local dishes. There are also the cakes with western flavors and Japanese, Russian and French delicacies. It is a "Town of Diet "with rich dietetic culture. Tianjin is world-famous for its cuisine culture and many tourists travel to Tianjin simply because they want to eat some local snacks or dishes. The traditional dishes are Cuttle Fish stewed with meat, and the boiled crabs. The snacks are Goubuli Baozi (gǒu bú lǐ bāo zǐ 狗不理包子), Erduoyan Fried Cakes (ěr duǒ yǎn zhà gāo 耳朵眼炸糕), Mahua (má huā 麻花), Cao's Donkey Meat (cáo jì lǘ ròu 曹记驴肉), etc. 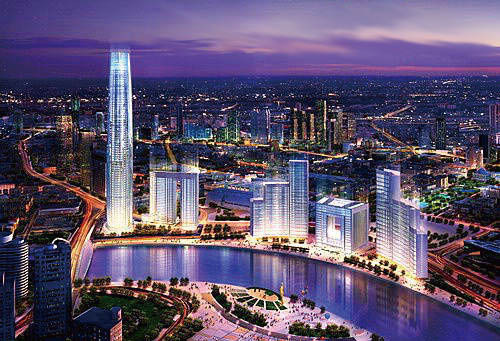 Tianjin is a complete paradise for people who love to shop and take souvenirs back home. Here you will find both traditional shopping stores as well as modern shopping malls. Shopping in Tianjin is surely going to be memorable experience for those who have a taste in arts and handicrafts. One of the most popular shopping places in Tianjin that is also famous world wide is Gu Wenhua Jie (gǔ wén huà jiē 古文化街). The entire street is filled with shops selling antiques, jade articles, traditional handicrafts like Niren Zhang (ní rén zhāng 泥人张) painted sculptures and Weiji (wèi jì 魏记) kites. This traditional shopping destination also provides you with a great architectural spectacle as both the sides of the street imitate architectural styles of the Qing dynasty. Shenyang antique market (shěn yáng dào gǔ wán shì chǎng 沈阳道古玩市场) is another place where you can lay your hands on antique goods that too with a little bargaining. This area, just west of the main shopping district, is packed full of curios both old and new. Even if you have little intention of buying anything, you will still have fun strolling the alleys, which are lined with dark, small shops and stalls. Bijniang Dao (bīn jiāng dào 滨江道) is one of the busiest shopping streets of Tianjin. Here you can get most of the general items one can think of. The Heping Business Street (hé píng shāng yè jiē 和平商业街) is a blend of both western and eastern shopping experience. Here you will find some of the leading western stores as well as few famous traditional Chinese stores. In Tianjin as mentioned earlier, you will also find modern western shopping complexes like Parkson shopping center, Jinhui shopping square (jīn huì guǎng chǎng 津汇广场) and supermarkets like Wal-Mart. There are a variety of specialty goods that Tianjin produces, the most obvious being the carpets, New Year posters and clay figurines. There are many factory outlets in the Tianjin area that produce its famous handmade carpets, although this is an expensive option, best done by those who know what they are doing. Tianjin Binhai International Airport (bīn hǎi guó jì jī chǎng 滨海国际机场) is an important transportation hub in China. The airport lies 13 kilometers from the city center and 30 kilometers from Tianjin Port. A thoroughly modern international airport, Binhai houses more than 40 international and domestic airlines. Regular shuttle buses run between the downtown area and the airport. There is also a bus to Beijing Capital International Airport from Binhai. Four large railway stations service Tianjin: Tianjin Railway Station, Tianjin North Railway Station , Tianjin South Railway Station and Tianjin West Railway Station. Tianjin Railway Station, the largest of the four, has train routes to Beijing, Jinan (jì nán 济南), Jixian (jì xiàn 蓟县) and Bazhou (bà zhōu 霸州). Express commuter trains run between Tianjin and Beijing every hour each day. The Beijing terminus is always Beijing Railway Station but both Tianjin Railway Station and Tianjin North Railway Station receive commuter trains. Check the ticket prior to departure. Four main expressways and five national highways traverse Tianjin, easily connecting the city to all major regional and national destinations. Tianhuan Long-distance Bus Station in Nankai District (nán kāi qū 南开区) is the most important bus station in Tianjin, servicing major nearby cities. Tianjin Port is the largest man-made port in China. Three domestic routes head for Longkou (lóng kǒu 龙口), Yantai (yān tái 烟台) and Dalian (dà lián 大连), while the international routes connect to Inchon, Korea and Honshu, Japan. Tianjin light railway is considered the longest throughout China with two departure stations, the light rail centers in Zhongshan Men (zhōng shān mén 中山门) and the Development Zone (kāi fā qū 开发区). The departure interval is 15 minutes and the entire distance will take forty minutes and costs CNY 6. Tianjin city-bus system consists of school bus routes, special sight-seeing routes and regular routes which include inner city and suburban lines. If you take an inner city bus route, you will pay CNY 1 for twelve kilometers or less and CNY 1.5 for more. If you take a suburb line you have to pay CNY 1 for the first ten kilometers and CNY 0.5 for each extra five kilometers. Tianjin Metro Line 1 is an extension of the original line. Metro Line 1 runs every fifteen minutes from 5: 30 to 22: 30. The flat rate fare is CNY 8 for all taxi types, while the distance surcharge varies from CNY 1.5 to 2 per additional kilometer according to the make of taxi. If the taxi stops altogether for five minutes, for any reason, you will have to pay a surcharge equivalent to the distance surcharge for each additional kilometer.